It's a annual Okinawa to Zamami Yacht race. The 28 mile race starts from outside Ginowan marina and follows a course through the Kerama islands, finishing outside Zamami port. The racers come from all over Japan and have crew from all over the world. The yacht race follows a handicap system. 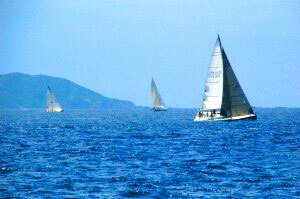 The Zamami Yacht race is one of the biggest and most exciting events of the Okinawa sailing community. The village of Zamami and the residents of this beautiful island put on a great show at the end, featuring music, dancing and great food and drinks.